Increase your understanding of the total fundraising process through the principles and techniques we teach. View the 2019-2020 Course Schedule by Date or Location. New Webinar Series! Register for an upcoming webinar or purchase archived webinar recordings. Successful fundraising is an ongoing process. As you continue to identify new donors, you also need to maintain good relations with current donors and encourage them to repeat and increase their giving. Learn and strengthen the fundraising skills that can sustain your organization including direct mail, online giving, major gifts and special events. Raise more money by receiving more major gifts. Consistent donors can become major donors when you effectively implement the Eight-Step Major Gifts Management Cycle. Identify and utilize your own communication strengths when meeting with donors to develop major gifts and increase your fundraising success. Build your fundraising skills to build your next building. Learn the five phases of a successful capital campaign that will help you design a visionary goal with a specific timeline, engage your board and involve your community – all while avoiding costly mistakes and maintaining your current funding. Maximize your fundraising by asking for planned gifts. Learn how to communicate with donors about their wealth and their financial assets – not just their cash – and how a planned gift can provide them with current income, an inheritance for their heirs and a legacy through your charitable organization. New course! Our founder, Dr. Henry Rosso, defined fundraising as “the gentle art of teaching the joy of giving.” This course goes beyond the specific tools and techniques of fundraising to teach the “amazing skills” of fundraising such as active listening, empathy, emotional intelligence, and additional others-focused skills that are central to connecting with donors and understanding their motivations. Fundraising and social media have one thing in common: both rely on relationships. As online fundraising continues to increase, establish proper expectations as you learn the knowledge and skills needed for fundraising success in cyberspace. Get the attention of your donors and prospective donors! When marketing and fundraising work together effectively, donors receive consistent, compelling messages that build trust and understanding. This trust encourages deeper involvement and support for your cause, even during times of crisis. You will learn to use marketing as a strategic management tool for fundraising, including creating print, digital, and event-based strategies to meet specific goals, communicating messages to media outlets effectively, and measuring organizational needs and effectiveness. New course! Fundraising occurs at the speed of trust. This course teaches and applies ethical principles that form the foundation of trusting relationships with donors. Learn how to build and sustain powerful relationships with women donors. Learn how to speak the unique language of businesses and corporations when raising support from the for-profit sector. Companies can fund and strengthen nonprofits in many ways. Gain skills and confidence for successful fundraising in the corporate office and the local business. Fundraising success depends on organization-wide efforts from the leadership of the board to the dedication of front-line staff. 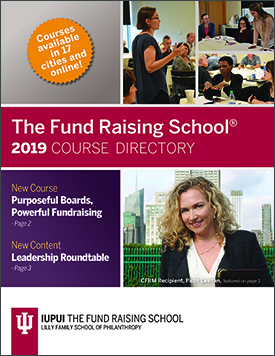 This course focuses on the role the board plays in fundraising and how to best structure the organization to support this role. Board members and staff will work collaboratively to develop an action plan to improve the culture of philanthropy in your organization, improve board recruitment and training, and ensure the organization has a solid case for support. This course is specifically designed for one staff person and one board member to attend together. New course! Based on the manifesto of philanthropy written by Robert Payton and Dr. Michael Moody, this course examines the unique influence and impact of philanthropy as “voluntary action for the public good,” including the voluntary action of charitable giving that is at the heart of fundraising. Get a strong foundation in the legal and managerial responsibilities of nonprofit organizations. This course focuses on the techniques and application of evaluation methods to assess the effectiveness of nonprofit programs. Learn clear action steps for refining and sustaining your strategic plan and enhancing your leadership effectiveness.